One of the most talented female athletes in the U.S. Originally from Minnesota, Missy Erickson’s early years included being crowned as Little Miss Minnesota at age 8, junior NHRA Drag racing titles throughout her early teens and recognition as a top ranked Nordic skier during high school. 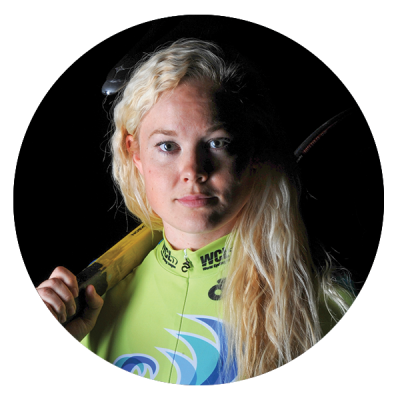 Her crossover from drag racing and Nordic skiing to cycling was complete after winning two national championship medals in her first year of bike racing in 2007 and the invitation to join the USA National Team the next year. Four years on cycling scholarship at Fort Lewis College and national team travel honed her sprint talent to where she has become a stellar performer in short fast track events with over 20 UCI international wins and four elite National Track Championship titles to her credit. In May 2015, she was involved in a training crash that broke her collarbone in three places, fractured her wrist, tore ligaments and meniscus, and gave her a severe concussion. After just two months, she competed at the UCI Marymoor Grand Prix, winning both the keirin and match sprint and later competed at the 2015 Pan Am Championships in September, where she placed 4th in the keirin, the highest sprint placing of both men and women. She has been selected to the USA long team for the Rio Olympics and will be using the WCL premiere event to prove she’s back!